But nuclear waste experts say the Japanese are literally playing with fire in the way nuclear spent fuel continues to be stored onsite, especially in reactor 4, which contains the most irradiated fuel — 10 times the deadly cesium-137 released during the 1986 Chernobyl nuclear accident. These experts also charge that the NRC is letting this threat fester because acknowledging it would call into question safety at dozens of identically designed nuclear power plants around the U.S., which contain exceedingly higher volumes of spent fuel in similar elevated pools outside of reinforced containment. The spent fuel in the hobbled unit 4 at Fukushima Daiichi not only sits in an elevated pool outside the reactor core’s reinforced containment, in a high-consequence earthquake zone adjacent to the ocean — just as nearly all the spent fuel at the nuclear site is stored — but it’s also open to the elements because a hydrogen explosion blew off the roof during the early days of the accident and sent the building into a list. Alarmed by the precarious nature of spent fuel storage during his recent tour of the Fukushima Daiichi site, Sen. Ron Wyden, D-Oregon, subsequently fired off letters to Secretary of State Hillary Clinton, Secretary of Energy Steven Chu, NRC Chairman Gregory Jaczko and Japanese ambassador to the U.S. Ichiro Fujisaki. He implored all parties to work together and with the international community to address this situation as swiftly as possible. As opposed to units 1-3 at Fukushima Daiichi, where the meltdowns occurred, unit 4’s reactor core, like units 5 and 6, was not in operation when the earthquake struck last year. But unlike units 5 and 6, it had recently uploaded highly radioactive spent fuel into its storage pool before the disaster struck. Robert Alvarez, a nuclear waste expert and former senior adviser to the Secretary of Energy during the Clinton administration, has crunched the numbers pertaining to the spent fuel pool threat based on information he obtained from sources such as Tepco, the U.S. Department of Energy, Japanese academic presentations and the Institute of Nuclear Power Operations (INPO), the U.S. organization created by the nuclear power industry in the wake of the 1979 Three Mile Island accident. What he found, which has been corroborated by other experts interviewed by AlterNet, is an astounding amount of vulnerably stored spent fuel, also known as irradiated fuel, at the Fukushima Daiichi site. His immediate focus is on the fuel stored in the damaged unit 4’s pool, which contains the single largest inventory of highly radioactive spent fuel of any of the pools in the damaged reactors. Alvarez warns that if there is another large earthquake or event that causes this pool to drain of water, which keeps the fuel rods from overheating and igniting, it could cause a catastrophic fire releasing 10 times more cesium-137 than was released at Chernobyl. That scenario alone would cause an unprecedented spread of radioactivity, far greater than what occurred last year, depositing enormous amounts of radioactive materials over thousands of miles and causing the evacuation of Tokyo. Nuclear experts noted that other lethal radioactive isotopes would also be released in such a fire, but that the focus is on cesium-137 because it easily volatilizes and spreads pervasively, as it did during the Chernobyl accident and again after the disaster at Fukushima Daiichi last year. With a half-life of 30 years, it gives off penetrating radiation as it decays and can remain dangerous for hundreds of years. Once in the environment, it mimics potassium as it accumulates in the food chain; when it enters the human body, about 75 percent lodges in muscle tissue, including the heart. An even more catastrophic worst-case scenario follows that a fire in the pool at unit 4 could then spread, igniting the irradiated fuel throughout the nuclear site and releasing an amount of cesium-137 equaling a doomsday-like load, roughly 85 times more than the release at Chernobyl. It’s a scenario that would literally threaten Japan’s annihilation and civilization at large, with widespread worldwide environmental radioactive contamination. Kamps noted that these pool fires were the beginning of the worst-case analysis envisioned by the Japanese government in the early days of the disaster, as reported by the New York Times in February. AlterNet asked the NRC if it is concerned about the vulnerability of the spent fuel at Fukushima Daiichi and what, if anything, it had expressed to the Japanese government and Tepco on the matter. But nuclear experts, including Arnie Gundersen, a former nuclear industry senior vice president who coordinated projects at 70 U.S. nuclear power plants, and warned days after the disaster at Fukushima last year of a “Chernobyl on steroids” if the spent fuel pools were to ignite, strongly disagreed with this assessment. He also said that the urgency of the situation is underscored by the ongoing seismic activity around northeast Japan, in which 13 earthquakes of magnitude 4.0 to 5.7 have occurred off the northeast coast of Honshu between April 14 and April 17. “This has been the norm since 3/11/11 and larger quakes are expected closer to the power plant,” Alvarez added. A recent study published in the journal Solid Earth, which used data from over 6,000 earthquakes, confirms the expectation of larger quakes in closer proximity to the Fukushima Daiichi site. In part, this conclusion is predicated on the discovery that the earthquake that initiated last year’s disaster caused a seismic fault close to the nuclear plant to reactivate. AlterNet asked Sen. Wyden if he considers the spent fuel at Fukushima Daiichi a national security threat. Yet Tepco’s current plans are to hold the majority of this spent fuel onsite for years in the same elevated, uncontained storage pools, only transferring some of the fuel into more secure, hardened dry casks when the common pool reaches capacity. 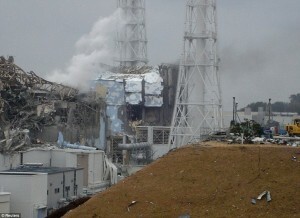 For the moment, though, and for the foreseeable future — unless the international community substantively comes to Japan’s aid — Tepco couldn’t transfer the irradiated fuel from the damaged reactor units into dry cask storage even if it wanted to because the equipment to do so, such as the crane support infrastructure, was destroyed during the initial disaster. Gunter is concerned that even a minor earthquake or a subsidence in the earth under unit 4 could cause its collapse. Alvarez echoed Wyden’s letters to the Japanese ambassador and U.S. officials. So why isn’t the NRC and the Obama administration doing more to shed light on the extreme vulnerability of these irradiated fuel pools at Fukushima Daiichi, which threaten not only Japan but the U.S. and the world? Nuclear waste experts say it would expose the fact that the same design flaw lies in wait — and has been for decades — at dozens of U.S. nuclear facilities. And that’s not something the NRC, which is routinely accused of promoting the nuclear industry rather than adequately regulating it, nor the pro-nuclear Obama administration, want to broadcast to the American public. There are 31 G.E. Mark I and Mark II boiling water reactors (BRWs) in the U.S., the type used at Fukushima. All of these reactors, which comprise just under a third of all nuclear reactors in the U.S., store their spent fuel in elevated pools located outside the primary, or reinforced, containment that protects the reactor core. Thus, the outside structure, the building ostensibly protecting the storage pools, is much weaker, in most cases about as sturdy, experts describe in interviews with AlterNet, as a structure one would find housing a car dealership or a Wal-Mart. Not what Americans might expect to find safeguarding nuclear material that is more highly radioactive than what resides in the reactor core. The outer containments surrounding these spent fuel pools in these U.S. reactors patently fail to meet the NRC’s own “defense in-depth” nuclear safety requirements. But these reactors don’t merely suffer from the same storage design flaw as those at Fukushima Daiichi. In the U.S., the nuclear industry has been allowed to store incredible volumes of spent fuel for decades in high-density pools that were not only originally designed to retain about one-fourth or one-fifth of what they now hold but were intended to be temporary storage facilities. No more than five years. That was before the idea of reprocessing irradiated fuel in this country failed to gain a foothold over 30 years ago. Once that happened, starting in the early 1980s, the NRC allowed high-density storage in fuel pools on the false assumption that a high-level waste repository would be opened by 1998. But subsequent efforts to gain support for storing nuclear waste at Yucca Mountain in Nevada have also been scrapped. More recently, the NRC arbitrarily concluded these pools could store this spent fuel safely for 120 years. Experts say the only near-term answer to better protect our nation’s existing spent nuclear fuel is dry cask storage. But there’s one catch: the nuclear industry doesn’t want to incur the expense, which is about $1 million per cask. He also pointed out that the contents of the nine dry casks at the Fukushima Daiichi site were undamaged by the disaster. The NRC declined to comment directly to accusations it’s reluctant to draw attention to the spent fuel vulnerability at Fukushima Daiichi because it would bring more awareness to the dangers of irradiated storage here in the U.S. But the agency did respond to a question about what it has done to address the vulnerability of spent nuclear fuel storage at U.S. nuclear sites with the Mark I and II designs. He continued, “After 9/11, the NRC required U.S. nuclear power plants to obtain additional equipment for maintaining reactor and spent fuel pool safety in the event of any situation that could disable large areas of the plant. This ‘B5b’ equipment and related procedures include ensuring spent fuel pools have adequate water levels. The B5b measures are in place at every U.S. plant and have been inspected multiple times, including shortly after the accident at Fukushima. But nuclear experts told AlterNet that the majority of Burnell’s response could’ve been made prior to the disaster at Fukushima. In fact, Ed Lyman, senior staff scientist at the Union of Concerned Scientists, investigated these so-called “B5b” safety measures the NRC ordered post-9/11 and published his findings in a May 2011 Bulletin of the Atomic Scientists article. Directly reflecting Burnell’s response to AlterNet, Lyman wrote that after the Fukushima disaster, “the NRC and the industry invoked the mysterious requirements known as ‘B5b’ as a cure-all for the kinds of problems that led to the Fukushima crisis. But contrary to these NRC assurances, then and now, Lyman’s report found B5b requirements inadequate, containing flaws in safety assumptions that suggest the NRC has not applied the major lessons learned from the Fukushima disaster. Additionally, he revealed emails showing that the NRC’s own staff members questioned the plausibility of these procedures to effectively respond to extreme weather events like floods, earthquakes and concomitant blackouts. This is a curiously roundabout way of saying that spent fuel pools at U.S. reactors currently have no built-in instrumentation to gauge radiation, temperature or pressure levels. Kamps also pointed out that the NRC commissioners voted 4 to 1, with Chairman Gregory Jaczko in dissent, to not require such requested safety upgrades to U.S. reactors until the end of 2016. Brad Jacobson is a Brooklyn-based freelance journalist and contributing reporter for AlterNet. His reporting has also appeared in The Atlantic, Columbia Journalism Review, Billboard and other publications. Follow him on Twitter @bradpjacobson.